I love to air layer figs. 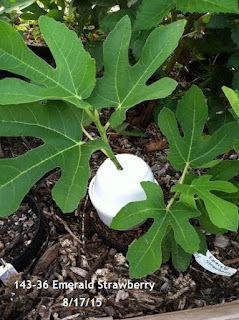 It is simply the best, most successful method for me personally, to multiply fig trees and can be done any time in our area from Spring up to August, though I did some last year early September, they could have had better roots if done a few weeks earlier. 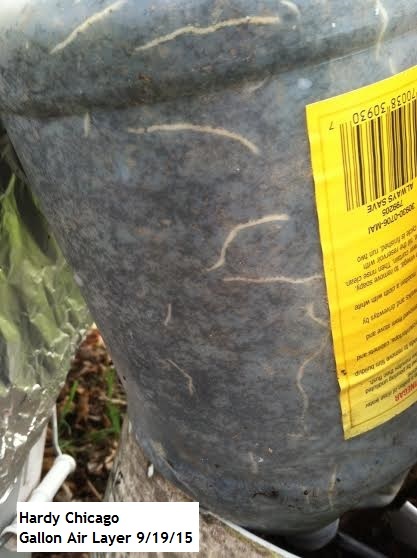 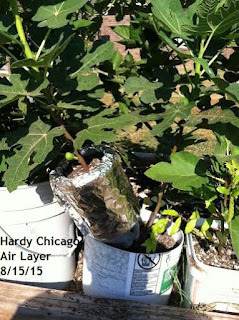 Air layering is simply surrounding a portion of a fig limb with moist media for long enough time that roots form well, then the limb is severed from the mother plant and re-potted, creating a new tree. 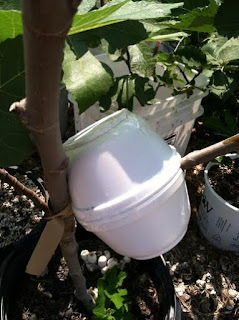 They can be done successfully with any size of limb, though larger limbs will create faster growing trees, sometimes ready to fruit and some may already have figs on while the layering is done. In that case it is best to wait until the fig(s) ripens and is/are removed before parting from the mother tree. Some people use recycled plastic bottles as a media container, some use various plastic bag configurations and some may simply wad a bunch of moist sphagnum moss around the limb and cover it with aluminum foil. 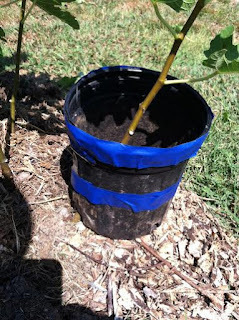 Some like a transparent container to be able and see the roots and some just go on time, knowing the roots are there. I personally prefer to air layer around mid August. 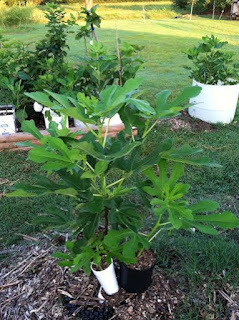 I know there will be roots well formed in plenty of time to separate from the mother and re-pot for winter to store away, gift or sell if that is one's goal. 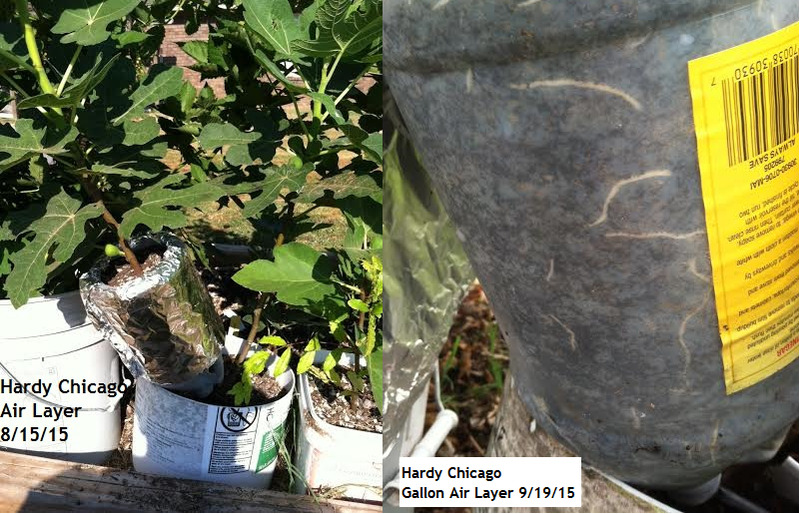 Here's a few pictures, showing some air layers I started back in August, just a little over a month ago. 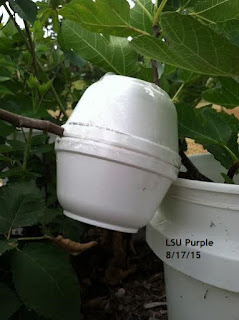 Most are recycled foam deli bowls, customized with strategically placed holes to fit each limb to be air layered. 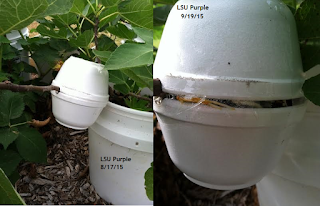 Once fit and taped at the seam, if there are two bowls being used, my rooting media, a 50/50 mix of compost and clay kitty litter, is moistened just a bit and is poured into the opening and foam top that was cut from a bowl bottom with razor knife is taped on. I prefer to use a media similar to what the new tree will be re-potted into so there is no need to disturb the newly formed roots. 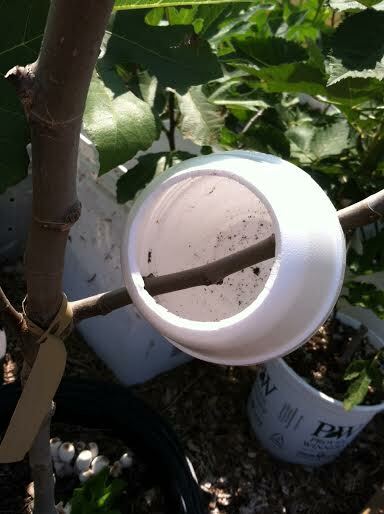 Some people will girdle the stem by removing a ring of bark. 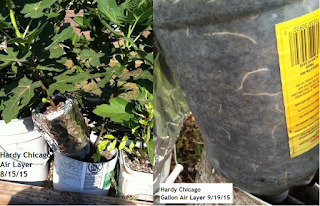 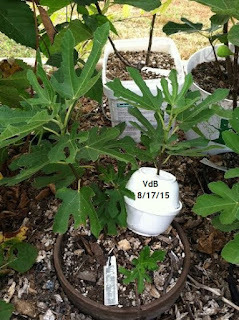 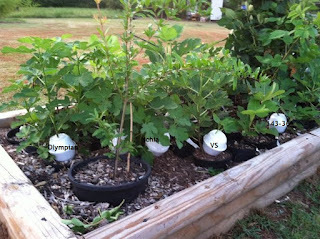 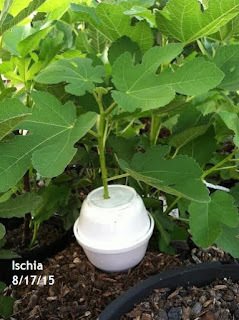 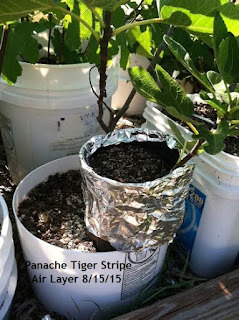 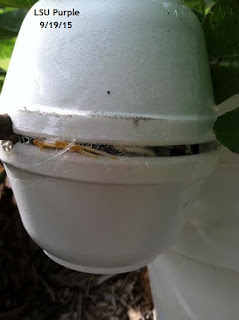 I have not found this to be necessary on any of the fig varieties I have air layered and only try to get two or three nodes in the area to be rooted. 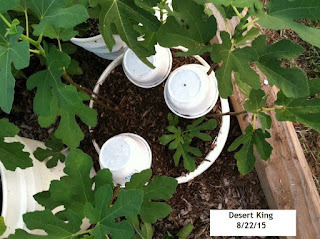 Multiple air layers in a five gallon pail on tissue cultured Desert King. 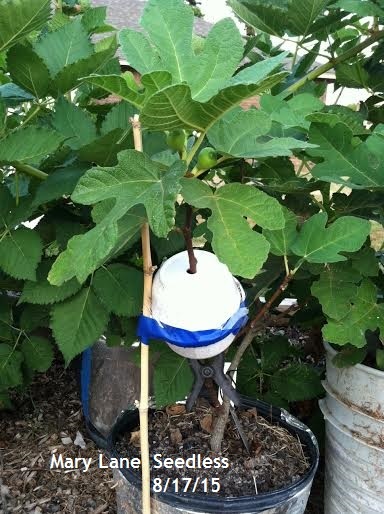 Tissue cultured figs often result in many stemmed plants, perfect for air layering in this manner. Olympian, Green Ischia, Vasilika Sika and 143-36 Emerald Strawberry. These were all started in the Fall of 2014 as single node cuttings in the same foam bowls being used to now air layer them. The black pots were buried down into a bed of wood chips to keep them cool during Summer. 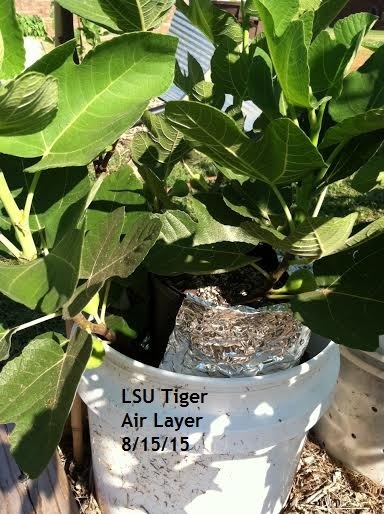 These type of air layers are left open at the top,covered with some sort of mulch and watered a little bit when regular watering is done, in my case, every 3-4 days. Depending on limb orientation it may be desirable, such as a limb poking out of the media right next to the main stem, to go through a bottom-side drain hole or make one custom if no holes are present. 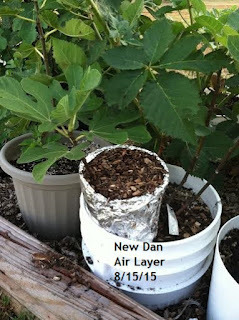 These air layers will remain on the mother plants a couple more weeks before I separate and re-pot them or I could simply leave them on until they go dormant and then re-pot. 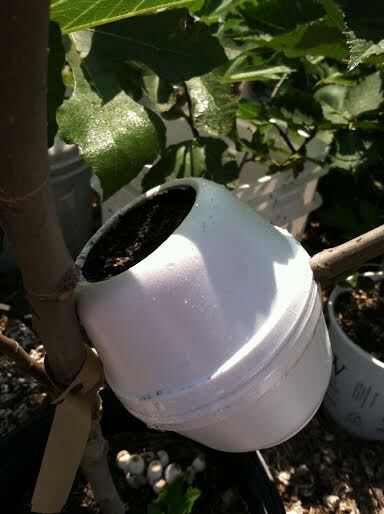 Will update this post when separations are made and show the root balls formed.